"The Topp Twins perform a version of the well-known song 'She'll Be Coming Round the Mountain', featuring a little girl as the female coming round the mountain, and various farm animals playing instruments and preparing for her arrival"--Publisher information. Suggested level: ju... read full description below. 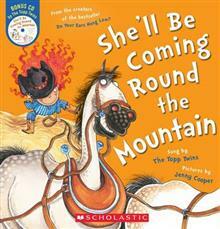 "The Topp Twins perform a version of the well-known song 'She'll Be Coming Round the Mountain', featuring a little girl as the female coming round the mountain, and various farm animals playing instruments and preparing for her arrival"--Publisher information. Suggested level: junior. The Topp Twins are the folk singing, twin sister comedy duo of entertainers Jools and Lynda Topp. They are known for their country music influenced style, live shows and television performances. This is the Topp Twins' third picture book and CD set for Scholastic, following the popular There's a Hole in My Bucket and Do Your Ears Hang Low? Jenny Cooper lives in Christchurch and has illustrated many picture books, including the very successful There's a Hole in My Bucket and Do Your Ears Hang Low? - also collaborations with the Topp Twins. She has also illustrated Scholastic NZ titles Alphabet Squabble, Down in the Forest, Shut the Gate, On a Rabbit Hunt and the Pick'n'Mix anthologies. Her recent illustrated novels are Vince Ford's Scrap series.